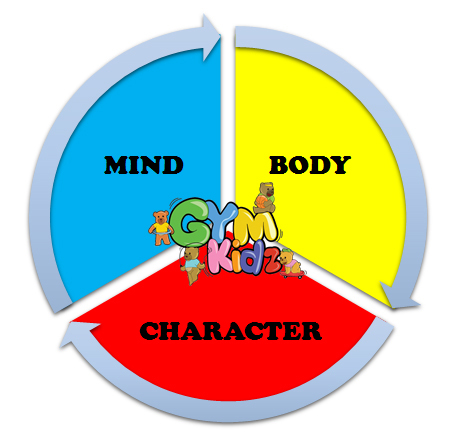 The GymKidz curriculum is based on a structured framework of a thematic and progressive nature that will ensure that the child’s natural abilities and capabilities is always considered whilst they are being enhanced by fun-filled but child-appropriate tasks and activities which guarantees success in their completion. Themes for the younger age groups from Nursery and below are synonymous with pre-school themes such as Myself, My Body, My Family, Occupations, etc. whereas themes for the older age groups will reflect on Social Emotional Learning themes such as Self-Management, Relationship Management, Responsible Decision-Making, etc. Opening activities for the younger age groups include action songs that will allow the young children to do warm-ups the fun way through music. The older children get to do stretching exercises through kid aerobics with songs like Thriller, Beat It, etc. Loco motor – here, children experience fundamental movements which include balancing forwards, backwards and side to side whilst ascending and descending along different balancing equipment. Height awareness is also progressively instilled with the use of equipment of different heights. Spatial awareness is enhanced when children are asked to crawl through tunnels of different forms. Axial – here, children are introduced to early gymnastics and learn to execute basic rolls like egg rolls and sausage rolls to more complex ones like forward rolls, backwards rolls, neck rolls and handstands with the use of different foam equipment. Coordination – here, children are introduced to basic skills like catching and throwing of different forms that will lead to acquire skills necessary for sports like basketball, football, hockey, volleyball and racquet games. Again, songs of a slower nature are used to allow younger children to recover from their physical exertions whilst older children engage in team games that develop leadership, teamwork and care for each other. Merit stickers are given to the children to reward them for their achievements and good work during the sessions. A child’s body is one big NETWORK…everything is connected.